Can Maryland Curb the Red Dots? What’s the state of Maryland’s Jerseyfication? I pulled these two great images off of a Maryland Department of Planning (MDP) document called “Growth and Land Use Trends.” They both foresee Maryland’s population reaching 6.7 million people by 2030 – or an increase of roughly 1 million people over the next 20 years. The two images represent the weighty choices the state has to make over the next few years if it hopes avert the unprecedented rates of sprawl predicted by experts. The first image shows the extent of development if existing local and state laws and policies remain unchanged. The second shows a smart growth scenario where local zoning becomes more closely tied to where the state and counties have agreed to prioritize development (Priority Funding Areas). The result of such an expanded smart growth program, MDP predicts, would be approximately 500,000 fewer acres developed over the next 20 years. That acreage represents 8% of the state’s total land area saved from development. Currently 20% of Maryland is developed. So if left unchecked the state’s developed land area could increase by about 54% in the next 20 years even though the population will only increase by 17.5%! • Current small area forecasts (where available in the state) are used to direct growth. Where small area forecasts are not available, MDP estimates future growth by assessing recent trends in the area. 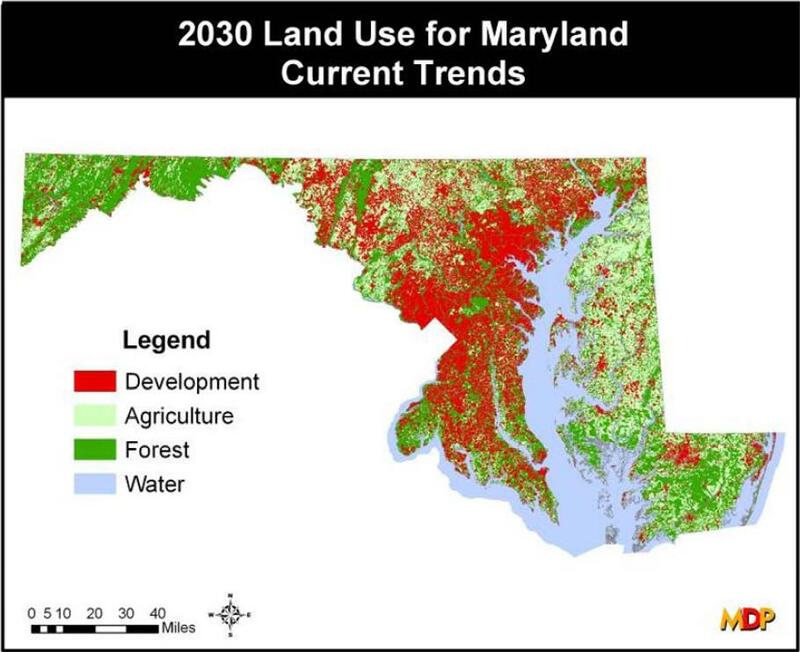 • This scenario results in approximately 650,000 new developed acres in Maryland by 2030. • 80% of future growth is directed to Priority Funding Areas (PFAs). • Allowable density inside PFAs is at least 4 dwelling units per acre. • Allowable density outside PFAs is 1 dwelling unit per 20 acres or less dense. • This scenario results in approximately 150,000 acres of new developed acres in Maryland by 2030 (500,000 fewer acres than under current programs). If you look closer at the two images, you’ll notice that the anticipated sprawl on eastern shore and the western panhandle of Maryland are virtually unaffected by the policy changes. The vast majority of the difference in the scenarios is the degree to which development infiltrates counties and portions of counties just outside the already heavily populated Baltimore-Washington Metropolitan area. Notice the dramatic difference in Frederick, Charles, and Harford Counties between the two scenarios. The no action scenario would not only wreak havoc on resource based economies of the state, but through fragmentation it would render much of the state’s publicly-funded protected conservation and agricultural lands useless for both wildlife and farming. The trend would also mean increasing problems for the Chesapeake Bay where stormwater runoff from suburbanization is already the fastest growing source of pollution. Perhaps most importantly for the everyday lives of the general population, the baseline scenario would cause disastrous problems for the state’s transportation infrastructure. By spreading the population so thinly, it would be virtually impossible to move the next million Marylanders by any means other than private automobiles. Be sure to check out my other recent posts on the flaws of Maryland nationally acclaimed smart growth policy and the enduring underlying causes of sprawl in American metropolitan areas.